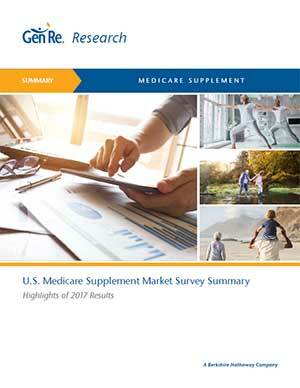 Gen Re is pleased to present this summary of results for our 2016/2017 U.S. Medicare Supplement Market Survey. 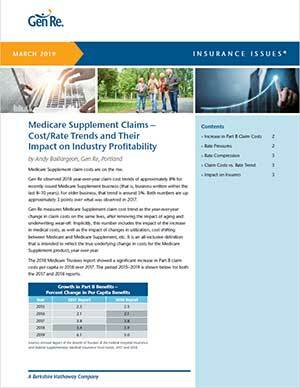 The full survey captures Medicare Supplement results and market trends for 2016 by examining sales and in-force numbers, claims trend, underwriting tools and practices, rate increase activity as well as movement across distribution channels. The full report is made available only to participants. A total of 57 questionnaires were completed for this year’s survey, representing 81 companies with Medicare Supplement (Med Supp) business. Throughout this report, the percentage of companies or number of companies refers to the 57 completed questionnaires. Additionally, depending on the type of question, not all companies were eligible to answer. To aid in your review, the number of responding companies is displayed as R=. Results were excluded from the report if less than four companies provided data. In-force and sales growth results for the industry and size segments were weighted by company size, which is based on in-force premium. All other results in the study were not weighted by the size of a company’s block of business. Each company has equal weight on the results for the industry and their size segment. Participating companies in this year’s survey reported a total of $21.7 billion of in-force premium for 2016. This represents a growth of 7.4% over 2015. (Exhibit B) The growth rate increases, however, when focusing only on those companies that were actively selling Medicare Supplement insurance in 2016. The actively selling participants experienced a growth rate of 8.2% in premium and 8.3% in lives. Total sales premium for actively selling companies totaled approximately $2.4 billion in 2016, an increase of 6.9% from 2015. (Exhibit C) Included in the premium sales growth results is an estimate for one company. The estimated premium figures for 2015 and 2016 were calculated by Gen Re. While 21 out of 42 companies experienced an increase in sales premium, a few had a disproportionate impact on growth results. As previously reported, Plan F remains the most sold plan, accounting for 50% of the total premium sold in 2016. (Exhibit D) Additionally, this was the most widely sold plan with 100% of the participating companies selling this plan, excluding the two companies that only sell in waiver states. In comparison, more than 70% of the participating companies reported selling Plans A, G and/or N; however, these three plans only represented 33% of sold premium in 2016. Looking to 2017, active companies expect the claims trend to average 4.7% for both 1992 Standardized Plans and 2010 Standardized Plans. The average 2016 lapse rate was 10.9% for active companies and 14.0% for closed companies. (Exhibit I) Compared to 2015, 48% of the active companies experienced a decrease in their lapse rate while 29% experienced an increase. A majority of the closed companies (53%) also reported a decline in their lapse rate. For underwritten applications, on average, 74.8% were approved and placed in 2016, while 16.2% were declined. (Exhibit K) When focusing just on those companies that provided data for 2015 and 2016 (29 companies), the decline rate increased from an average of 15.2% in 2015 to 15.7% in 2016. Seven out of 45 companies reported using an automated underwriting system, with four additional companies planning to add this system in the next 24 months. An automated underwriting system was defined in the questionnaire as a system to approve underwritten, web-based applications without human involvement. Of the applications going through this automated underwriting system, on average, 15% were approved. In this year’s survey, over half of the companies reported they were selling direct-to-consumer. (Exhibit M) This was defined as selling a Medicare Supplement policy over the phone, online, through the mail, or a combination of these methods without assistance from a traditional agent that is paid a traditional compensation.